Wednesday’s eclipse – is the first of the series that will fall over the Gemini/Sagittarius axis. The North Node moved into Sagittarius on Feb. 13th 2011, and is currently positioned at 24 degrees 15. Due to the distance from the Nodes, eclipse is in 11 degrees Gemini, Wednesday’s eclipse will be partial. Eclipses behave rather like black holes. They have the mysterious ability to draw events towards them. For example, it seems fairly obvious to me that Oprah Winfrey’s last show on May 25th – is linked to this eclipse. Gemini typifies the talk show, the Sun eclipsed, the lady in question leaves center stage. Given we are talking cycles here, it is remarkable how events linked to the previous Nodal journey through Sagittarius/Gemini are now drawing to a conclusion. Take for example the case of the black youth Stephen Lawrence – murdered on April 22nd 1993. A little over a week ago the MET announced that two members of a racist gang are to stand trial for Stephen’s murder in November 2011. So, finally justice (Sagittarius) for the Lawrence family? On 16 April 1993, the Bosnian enclave of Srebrenica – was declared a UN safe zone. The arrest last weekend of Ratko Mladic – who will now stand trial for his role in the murder of 7.500 moslim men and boys at Srebrenica – seems to suggests that the Sag/Gem axis is one that is also clearly related to the idea of justice. Other noteworthy events surrounding the 1993 eclipse include the Waco incident – the death of David Koresh and 76 other members of the Branch Dividian sect (19 April 1993). While on the more Geminian side of the fence, on April 30th – tennis player Monica Seles was stabbed in the back by an obsessed fan of Steffi Graf. I can hardly imagine a more Geminian sport than tennis. Coming back to Brady’s ideas on this eclipse – it is clear where this idea of sinister energy comes from. 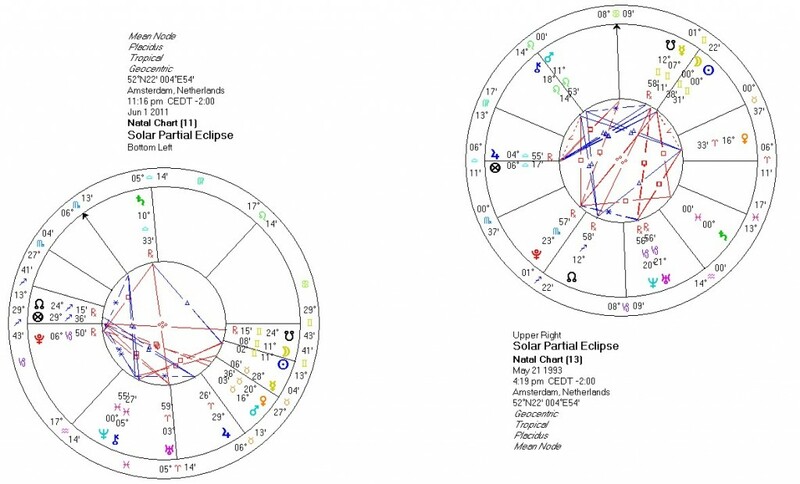 Charts shown below are the 1993 and the 2011 eclipses. Click on the image to enlarge. The 1993 eclipse horoscope looks and feels much darker than the 2011 eclipse horoscope. The close square from Sun/Moon to Saturn – combined with Mercury – eclipse ruler – on the South Node of the ’93 chart – suggests abandonment, letting go of restraints. Watery Saturn – is not good at knowing where its border lie. In the case of Waco for example- bad management by the authorities (the Sun) of the situation – did little to win the trust of the community (the Moon). In the 2011 chart – Saturn is extremely well placed though retrograde – while eclipse ruler Mercury – is pragmatic when in Taurus. The desire (Venus – ruler of Saturn and eclipse ruler Mercury) to win practical advantage coupled with a desire for concrete gains play a more significant role in the current eclipse, making it, in my opinion, altogether more constructive. 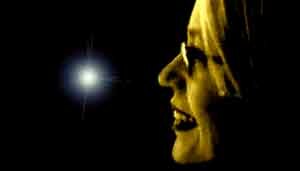 Dit bericht is geplaatst in Astrology English, eclipsen, maanfasen, mundane astrologie en getagdastrology, eclipse, eclipses, Gemini, horoscope, Sagittarius, saros cycle. Bookmark de permalink. Very interesting for me as a Sag, thanks Liz! I didn’t know about Saturn being a watery planet not knowing where its borders lie. I always thought that Saturn was all about structure, borders, discipline, rules and so on. Hi Cem, That is of course so – however Saturn has an easier time in some signs than in others. Pisces is the last zodiac sign – ruled by chaotic Neptune. Saturn is not at its best here. Pisces is unstructured as is the water element it falls under – so yeah – there is a sort of basic dichotomy here. Was het Mellie die zei: van Saturnus in Water krijgt men prut, in Lucht de woestijn en in Vuur bakt het harde stenen?